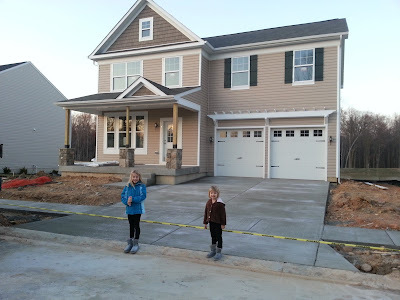 3 Kids, 2 Jobs, 1 Life: Driveway and Sidewalks and Grading, OH MY! 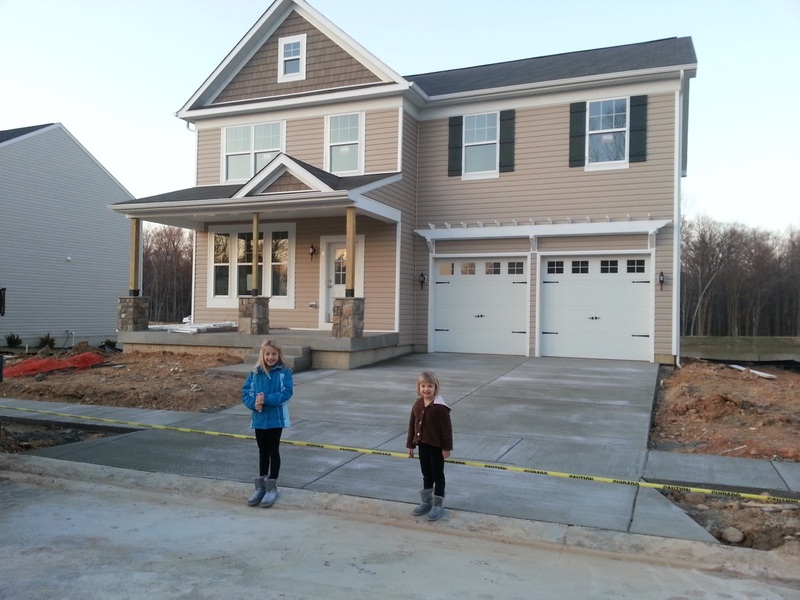 Driveway and Sidewalks and Grading, OH MY! Anyway, even though we didn't put any marks in it, I was dead set on getting over to see it after dinner. Holy heck it was COLD!!! 46 degrees and windy. BRRRR! 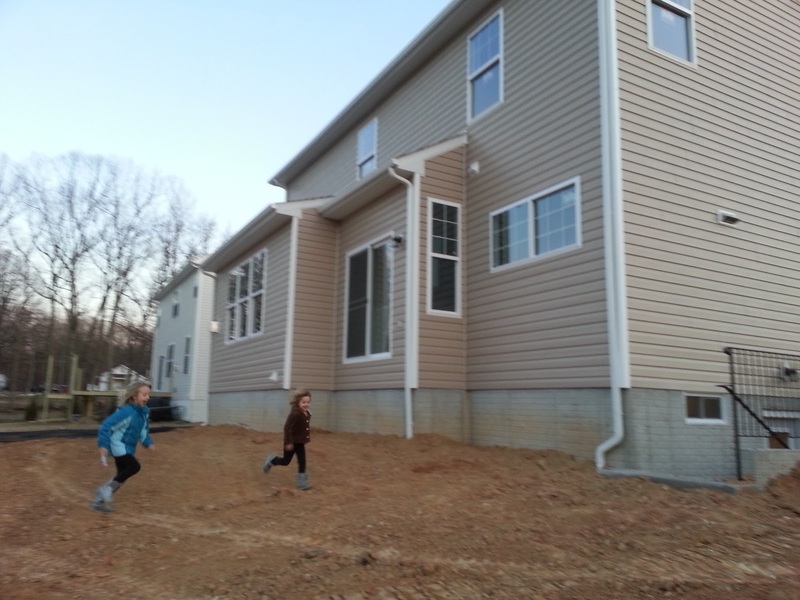 It did not feel like April 2 or as I imagined it would feel the day our driveway was poured. But either way, it looked great! It is really starting to look finished - I wasn't expecting how much different it would make everything look. We didn't walk on it and try out the new front steps but we did take a walk around the house since the entire yard is now graded (bulldozer must have been fixed) and the girls ran around a few times. (Their first new yard frolic!) I was really pleased with finally having the sidewalk poured to be able to see the house in respect to where everything will be situated. I'm guessing that now that the driveway is poured and the lot is graded that sod and landscaping could happen at any time - now THAT will be a visual impact. My only nagging complaint about the appearance of the house right now is the pillars on the front porch. The stone company is supposed to be correcting them. Jason thinks they are supposed to be higher before putting on the white columns (which I'm not concerned about) but the far right pillar is hanging off the edge of the porch too much for my liking and I worry about the longevity of that pillar if it's not positioned correctly. All things that still have three weeks to be fixed so I'm not truly worried. A lot of little cosmetic things still need to be done on the exterior too but with 3 weeks to go, there is plenty of time for them to be fixed. We looked in the basement too and could see that the carpet was put down as well. I can only imagine how much that changes the feel of the house on the inside too. But right now it's all covered in plastic (much like the hardwood is covered) so going into look isn't that exciting. Exactly 3 weeks from right this moment, I am planning to be loading up the van and Pilot with stuff from my mom's to take to the house immediately after settlement. 3 weeks!!! We are almost there. I cannot wait!